^ Elderkin, Phil (October 5, 1984). "Walter Alston's 'one-year contract' added up to seven pennants". ^ "Walter Alston Stats". Baseball Almanac. Retrieved November 6, 2012. ^ a b c d Johnson, Bill. "SABR Baseball Biography Project: Walter Alston". ^ a b c d e f "Walter Alston". Society for American Baseball Research. Retrieved August 8, 2014. ^ a b c Rogers, Thomas (October 2, 1984). "Walter Alston is dead at 72; Dodgers' manager 23 years". ^ Gladstone, Ken (December 12, 1973). "Rich tradition". ^ a b c d "Walter Alston Minor League Statistics & History". ^ "Walter Alston: Fielding". Sports Reference, LLC. Retrieved August 4, 2013. ^ Graf, Norma (July 25, 2013). "Baseball found a home here in the 1930s". ^ a b Golenbock, Peter (2010). Bums: An Oral History of the Brooklyn Dodgers. ^ Tygiel, Jules (1997). Baseball's Great Experiment: Jackie Robinson and His Legacy. ^ Dickson, Paul (2011). The Dickson Baseball Dictionary. W. W. Norton & Company. ISBN 0393073491. ^ Tygiel, Jules (January 1997). Baseball's Great Experiment: Jackie Robinson and His Legacy. ^ "1949 St. Paul Saints". ^ a b c d "Walter Alston Dies, Ex-Dodgers Manager". ^ "Walter Alston Minor League Statistics & History". ^ "Hall of Fame Inductee - 2010: Walter Alston" (PDF). ^ "Dressen quits Dodgers in contract wrangle". ^ Sullivan, Neil (1987). The Dodgers Move West. ^ Snider, Duke; Pepe, Phil (2006). Few and Chosen Dodgers: Defining Dodgers Greatness Across the Eras. ^ McNeil, William (2000). The Dodgers Encyclopedia. Sports Publishing, LLC. p. 125. ^ Clavin, Tom; Peary, Danny (2012). Gil Hodges: The Brooklyn Bums, the Miracle Mets, and the Extraordinary Life of a Baseball Legend. Penguin. p. 112. ^ "1954 Brooklyn Dodgers". Baseball-Reference.com. Retrieved April 19, 2014. ^ "Bums' Walt Alston is Still the Quiet Man". ^ a b "Bums Won't Let up in Play, Says "Unknown" Walt Alston". ^ Miller, Stuart (2006). The 100 Greatest Days in New York Sports. Houghton Mifflin Harcourt. p. 35. ^ Oliphant, Thomas (April 1, 2007). Praying for Gil Hodges: A Memoir of the 1955 World Series and One Family's Love of the Brooklyn Dodgers. St. Martin's Press. p. 69. ^ "Sandy Koufax Statistics and History". ^ Jaffee, Robert David. "Dodgers hit grand slam in history of Jewish players". ^ a b c d e Los Angeles Dodgers Team History & Encyclopedia. Baseball-Reference.com. Retrieved April 19, 2014. ^ "Snider proclaimed 1956 slugging champion". ^ Springer, Steve (March 29, 2008). "Command(er) performances". ^ "1959 Los Angeles Dodgers". ^ Mann, Jack. "Dodgers Down-and Up." Sports Illustrated. October 18, 1965. ^ "Walt Alston Snubs Ace Brave Hurlers". ^ Richman, Milton (March 30, 1962). "Will Jinx Hit LA Again?". ^ a b "Walt Alston, Given Approval, Does the Same for Durocher". The Dispatch. October 18, 1962. Retrieved August 4, 2013. ^ Hoffman, Benjamin (October 17, 2012). "Beware the broom: A history of sweeps of the Yankees". ^ "Alston won't let team forget 1964". ^ a b Merron, Jeff (September 26, 2001). "Green, Koufax and Greenberg -- same dilemma, different decisions". ^ D'Antonio, Michael (2009). Forever Blue: The True Story of Walter O'Malley, Baseball's Most Controversial Owner, and the Dodgers of Brooklyn and Los Angeles. Riverhead Books. pp. 301–302. ^ Langill, Mark (September 3, 2008). "Koufax, Drysdale were a dynamic duo". ^ Klein, Gary (June 23, 2013). "Dodgers' infield of the 1970s had a lasting impact". ^ "Mike Marshall Statistics and History". ^ Talley, Rick (October 16, 1974). "Alston mulls using Marshall as a starter". 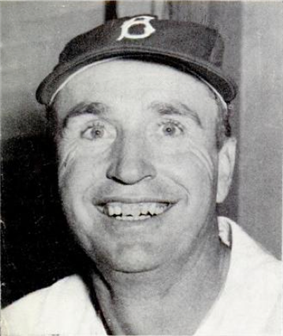 ^ a b "Veteran Dodger Manager Walter Alston to Retire". ^ "Walt Alston to Step Down". The Telegraph. September 28, 1976. Retrieved August 5, 2013. ^ Davies, Richard (2010). Rivals! : The Ten Greatest American Sports Rivalries of the 20th Century. ^ Koppett, Leonard (January 1, 2000). The Man in the Dugout: Baseball's Top Managers and how They Got that Way. ^ "Alston, Walter". National Baseball Hall of Fame and Museum. Retrieved November 6, 2012. ^ Corcoran, Dennis (2010). Induction Day at Cooperstown: A History of the Baseball Hall of Fame Ceremony. McFarland. p. 141. ^ "Sports World "Blue" Over Alston Death". ^ Garcia, Dan (October 2, 1984). "Walter Alston Dies". The Madison Courier. Retrieved August 5, 2013. ^ a b "Walter Alston Dead at 72". ^ "Alston Dies; Won 4 Series". The Milwaukee Journal. October 2, 1984. Retrieved August 5, 2013. ^ "Ohio Laws and Rules: 5533.39 Walter Smokey Alston Memorial Highway". LAWriter. Retrieved August 5, 2013. ^ "Class of 2010" (PDF). ^ Mitchell, Houston (April 26, 2013). "The 20 Greatest Dodgers of All Time, No. 16: Walter Alston". ^ Ratterman, Bob (August 14, 2013). "Darrtown gears up for bicentennial with pavers, big plans". The Oxford Press. Retrieved October 31, 2013. The Dodgers returned to the 1965 World Series. Alston could not start his number one pitcher, Koufax, in the opening game of that series because Koufax was observing Yom Kippur. Instead, Alston turned to Drysdale, who struggled, lasting 2 2⁄3 innings and surrendering seven runs. 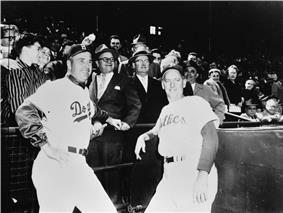 Afte the game, a reporter said to Alston, "I bet you Drysdale was Jewish, too." The team recovered from losing that first game and they won the World Series in seven games. Koufax appeared in three games during the series, registering two shutouts.